Welcome to Victoria Windrows in Rancho Cucamonga! 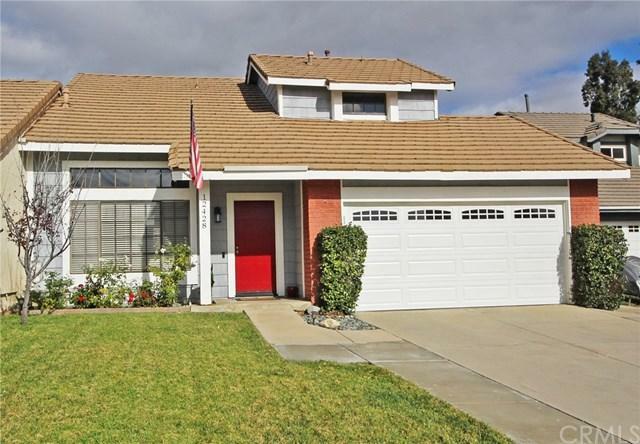 This beautiful 2-story home has been tastefully upgraded! Located near the top of a cul de sac, this south facing home has inviting curb appeal. The entryway opens to the large living room with a fireplace under a two story vaulted ceiling. The family room is also spacious with a sliding glass door to the patio. It opens to the dining area and remodeled kitchen with granite counter tops, white cabinetry and stainless steel appliances. You will find plenty Welcome to Victoria Windrows in Rancho Cucamonga! This beautiful 2-story home has been tastefully upgraded! Located near the top of a cul de sac, this south facing home has inviting curb appeal. The entryway opens to the large living room with a fireplace under a two story vaulted ceiling. The family room is also spacious with a sliding glass door to the patio. It opens to the dining area and remodeled kitchen with granite counter tops, white cabinetry and stainless steel appliances. You will find plenty of additional storage on the main level in the kitchen, dining area, and in a large closet in the guest bathroom. Relaxing master suite offers a vaulted ceiling, ceiling fan, mirrored closet doors and ensuite bathroom. The master bathroom has a separate vanity area and modern tiled walk-in shower with a glass enclosure and alcove shelf. There are 2 additional bedrooms plus a full bathroom on the second level. Extensive use of laminate wood flooring throughout! Outside, you have a spacious solid patio cover, open patio area for BBQs, lawn and cascading water feature. The raised plant bed faces south, perfect for your organic veggie and fruit garden! We are near shops, parks, schools, restaurants and more. Take a closer look at this exceptional home today!